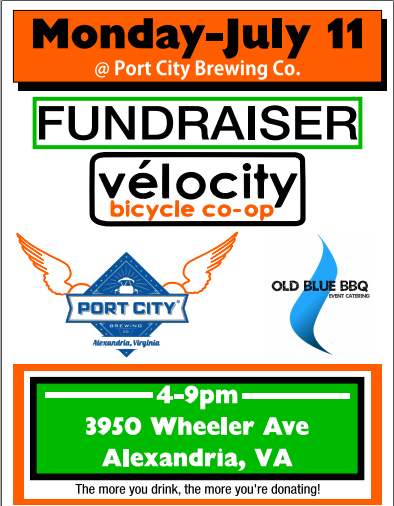 On Monday, July 11th, you’re invited to a VéloCity fundraiser at Port City Brewing Company in Alexandria! From 4-9pm a portion of the proceeds from beer sales will go to support the co-op. We’ll also be holding a raffle with prizes from local businesses and a Gold Sprints stationary bike race featuring teams from area bike co-ops and advocacy groups. And, Old Blue BBQ will be on hand selling really great barbecue! All funds raised on the 11th will support VéloCity’s mobile capabilities, allowing us to provide more services at events like the East of the River Bike Clinics and to jump-start similar programs in Northern Virginia. Can’t make it to Port City? Make your tax-deductible donation online now.